Halt On Juvenile Immigrant Visa Leaves Thousands In Limbo According to Border Patrol, more than 120,000 unaccompanied children arrived in the past two and a half years, many seeking asylum. Some young immigrants are now trying to use a new visa category. 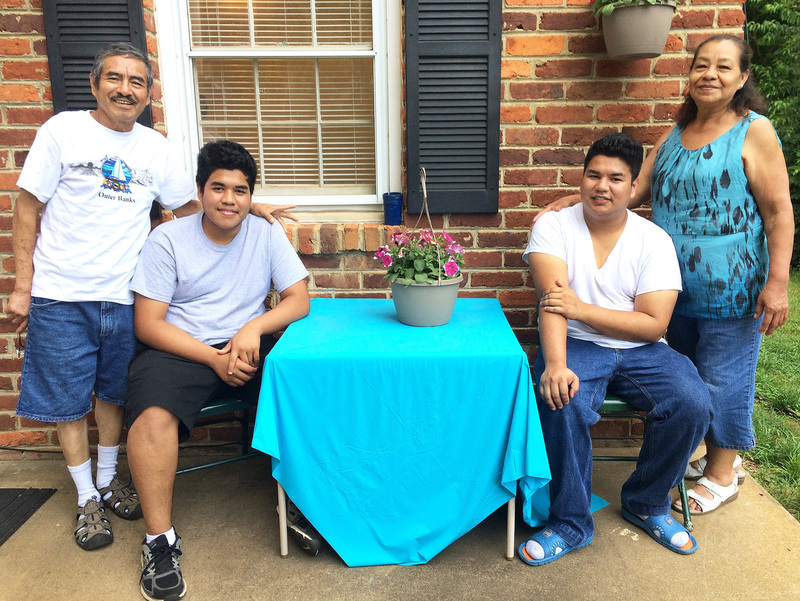 Edson Escobar, 16, (seated, left) and his brother Alex Escobar, 18, (right), with their grandparents Ricardo and Sara Tejada in central Virginia. Edson and Alex came to the U.S. from El Salvador separately two years apart to escape their abusive father. Immigration is an intricate part of the history of the United States. But in 2012, a new trend appeared: juveniles traveling alone showed up at the border in huge numbers. President Obama became alarmed, and two years later visited Central America and the border to send a message of deterrence to parents and minors who were planning to make the journey north. 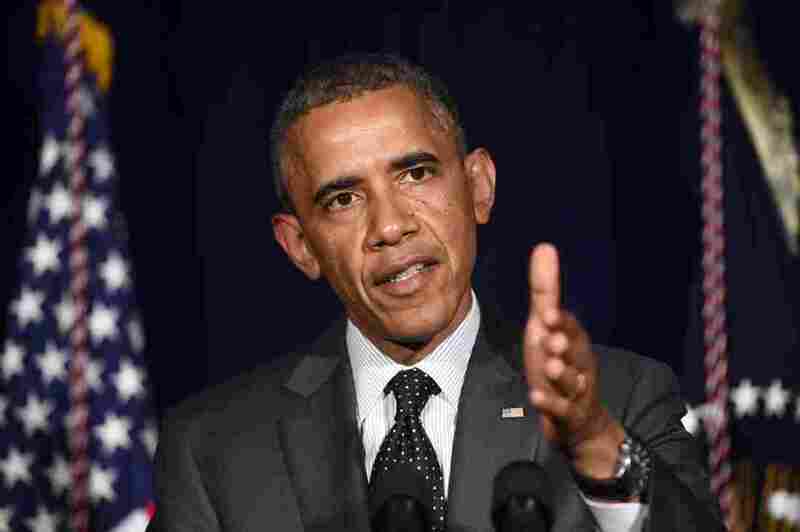 "While we intend to do the right thing by these children, their parents need to know that this is an incredibly dangerous situation and it is unlikely that their children will be able to stay," says Obama, speaking in Dallas on July 9, 2014. According to the U.S. Border Patrol, more than 120,000 unaccompanied children have arrived at the southern border in the past two and a half years. Many are seeking asylum. But applying for asylum isn't easy. As a result, some young immigrants are choosing another way of staying in this country legally: a visa category called "Special Immigrant Juvenile Status." Obama's message was meant to deter minors like Alex and Edson Escobar. The brothers are from El Salvador and they traveled to the U.S. separately. Alex, who's 18, came in 2014. His 16-year-old brother, Edson, came this spring. As they sit in their grandparents' modest home in central Virginia, Alex recalls the day he knew he would have to leave El Salvador. "My father came home drunk one day, and for no reason started hitting my mother," Alex says. "My younger brother and I tried to defend her. My father was so enraged; he grabbed billiard balls and threw them at us. He hit me in the chest." Thousands Of Central American Migrants Seek Asylum In U.S.
Alex crashed through a window, cutting his arms, back and hands. And that's when he says he knew he had to escape. He was 8 years old. He says that it suddenly clicked in his mind: "I'm in front of my father, the person who gave me life and he can kill me right now." Alex's facial muscles tense as he remembers. "My dad is the villain in my life's story," he says. "My mom's my protector and my maternal grandparents are my guardian angels." He says his grandparents took him in and cared for his wounds when his dad beat him, until his "guardian angels" migrated to the U.S. legally. Alex was 13. "That was my life in El Salvador," Alex says. His younger brother, Edson, is looking at an iPad with a picture of their mother, who is still in El Salvador and not eligible for a visa. I would feel sad if it didn't work out, as all my dreams collapsed and the possibility to better myself disappeared. "Sometimes I feel sad that I may never see her again," Edson says. "Yes, I miss her very much." Because the brothers came to Virginia separately, two years apart, they face possibly different outcomes in their immigration status. The Special Immigrant Juvenile Status visa was created for undocumented minors like Alex and Edson, who have been abused, abandoned or neglected by parents in their home country. The applicants have to meet other criteria as well, including being unmarried, law abiding, and meeting an age limit. The visa was designed for humanitarian reasons, but it has its critics. "We are tolerating a lot of illegal immigration," says David North, an analyst with the Center for Immigration Studies, a think tank in Washington, D.C., that advocates for reduced immigration. "We create massive differences in income equality," North says. "And so you have a question of what's good for society and what's good for these young men." But according to New York Law School Professor Lenni Benson, the visas aren't what attract the unaccompanied minors. She says they come north fleeing violence and abuse. "They don't come to the border and say, 'I want to apply for an I-360 based on the Fourth Preference Employment-based Special Immigrant Juvenile 101A-27J,' " Benson says. "They say, 'I can't go home!' "
President Barack Obama requested emergency funding from Congress to help cope with a surge of unaccompanied child immigrants from Central America on July 9, 2014 in Dallas, Texas. But demand for the visa is exploding. In 2010, less than 1,600 such visas were issued. Last year, the number shot up to more than five times that. That's why the State Department in April announced that visas for unaccompanied minors from El Salvador, Guatemala and Honduras had maxed out until the new fiscal year, creating a huge backlog of applicants. "And that has never happened before in the past," says Tanishka Cruz, a lawyer with the Legal Aid Justice Center, a group that helps low income residents in Virginia. "So it's a completely novel issue." Cruz is representing Alex and Edson on a pro-bono basis. She says that, prior to the April announcement, "I was able to tell a child, 'This is what you can expect at every stage of litigation.' But now it's a lot more unclear." What's unclear is how long a special immigrant juvenile will have to wait to get a visa, and therefore a green card or lawful permanent residency and work authorization. Cruz says that many will stay in limbo and without access to opportunities while waiting for a SJM visa. As for Alex Escobar, in May he went before an immigration officer and his visa was approved — though he will have to wait until one becomes available, perhaps this fall, but there are no guarantees when. The good news is that he's approved to work and drive while he waits, and he'll continue his school work as well. Meanwhile, his brother Edson's case could take years to resolve because he just arrived here and there are so many other Central American juveniles ahead of him. He's trying to stay positive. "I would feel sad if it didn't work out, as all my dreams collapsed and the possibility to better myself disappeared," Edson says. Edson says he can't go back to El Salvador, one of the most violent countries in the world. "I have no future there," he says. Edson is attending summer school now, and he'll start tenth grade this fall. The problem, Benson says, is that no one knows how long someone like Edson could remain in limbo. "I don't think that in the future it's going to be a one-year wait. It might be a two-year wait. It might be a three-year wait," she says. Benson says this problem exists throughout all immigration law. "I think the important thing about the Central American issue is to see it as another refugee crisis and not to see it as the same other patterns of overstay or unlawful entry or migration," Benson says. The good news, Benson says, is that Alex and Edson Escobar have legal help. There are thousands of kids, she says, who are abused, abandoned or neglected and have no help at all.